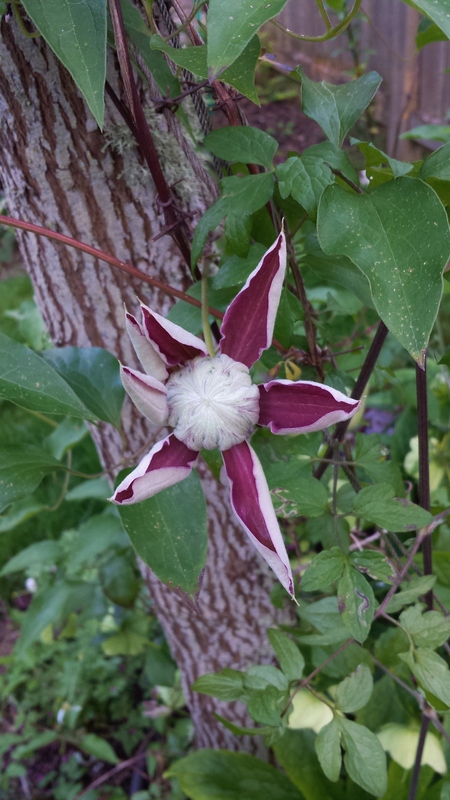 And the Winner Is…Clematis Will Baron! 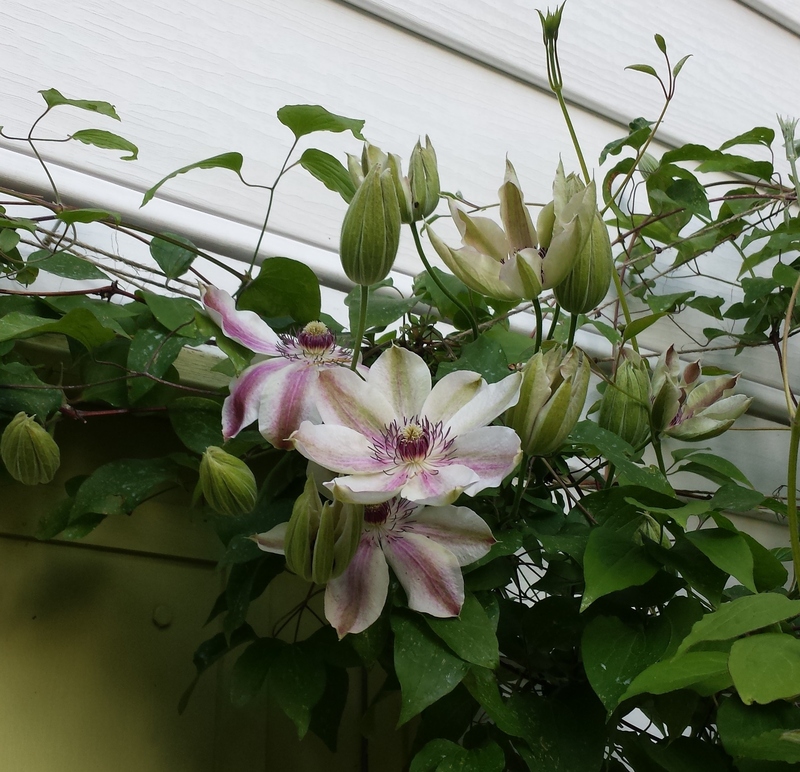 Clematis Will Baron Wins Again! Base of C. Will Baron before cutting through the three oldest vines. Note the three younger vines on the left. 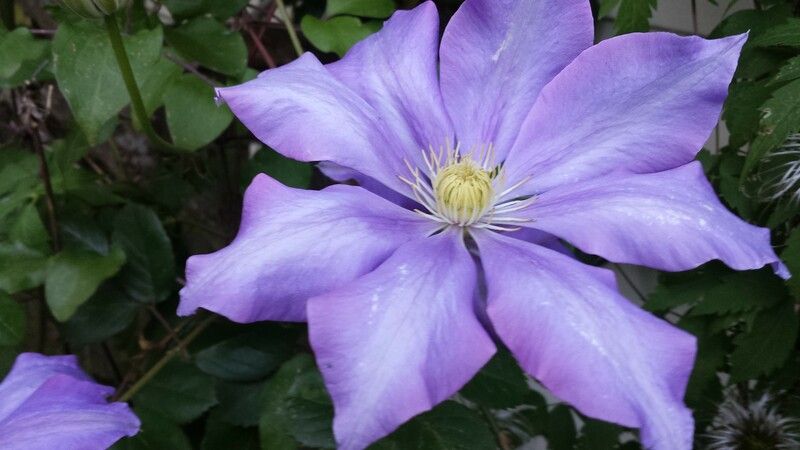 In my garden last year, the reliable and beautiful C. Will Baron won Clematis of the Month in May 2014 for it’s beautiful blooms and for being the first of the large-flowered clematis to bloom for me. 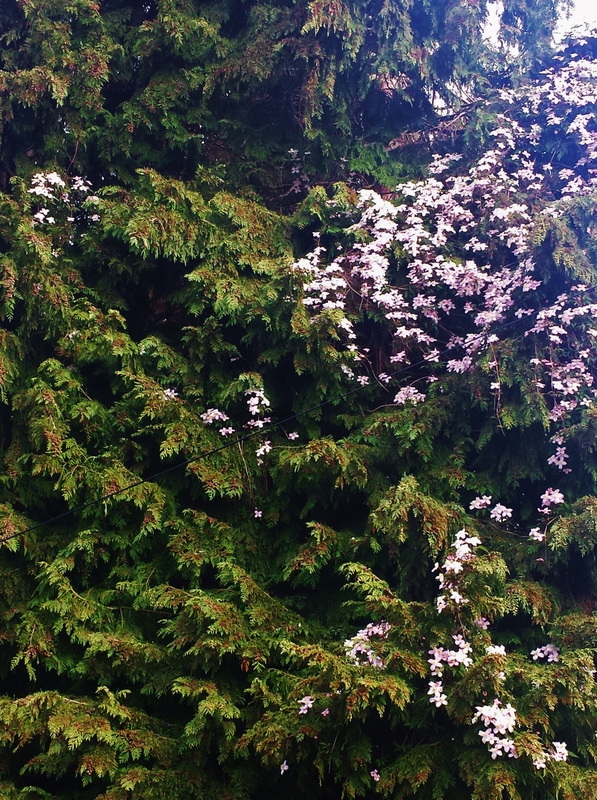 This year Seattle’s mild winter and early warm spring brought Will out first again, a full month early–it’s leading bloom opened on April 9th (first bloom last year was May 10th)–and this was in spite of being heavily pruned in January. Flowers all over my garden are coming into bloom several weeks early, making us Seattle gardeners worry about what will be left to bloom in June! Roses are out already, as are alliums, iris, Spanish lavender, poppies, even rock roses. Crazy. Base of C. Will Baron in April. 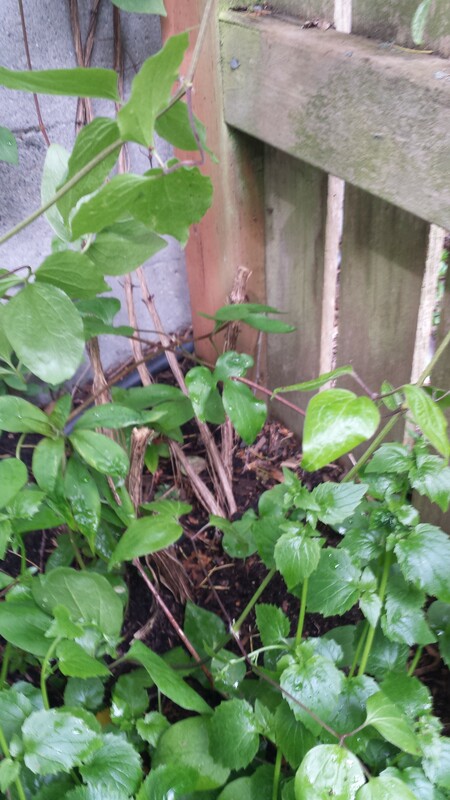 Three old vines are gone, replaced by much new growth (accompanied by groundcover campanula). The passage of time has had a negative effect on C. Will Baron, which has graced my garden for about ten years now. It slowly developed a large and unruly rat’s nest of dead vines. Each year the live vines would coat the outside of this giant ball with gorgeous flowers. So, what’s the problem, you ask? Unfortunately, as the rat’s nest got bigger and bigger, more and more plants below suffered from too much shade. Last year I intended to cut Will back in late winter, but chickened out when loads of tiny new flower buds formed. This year, in the dead of January, I finally got up my courage. At the base of the plant I cut through three thick old woody canes that looked almost hairy with pealing bark, leaving three much younger canes alone. 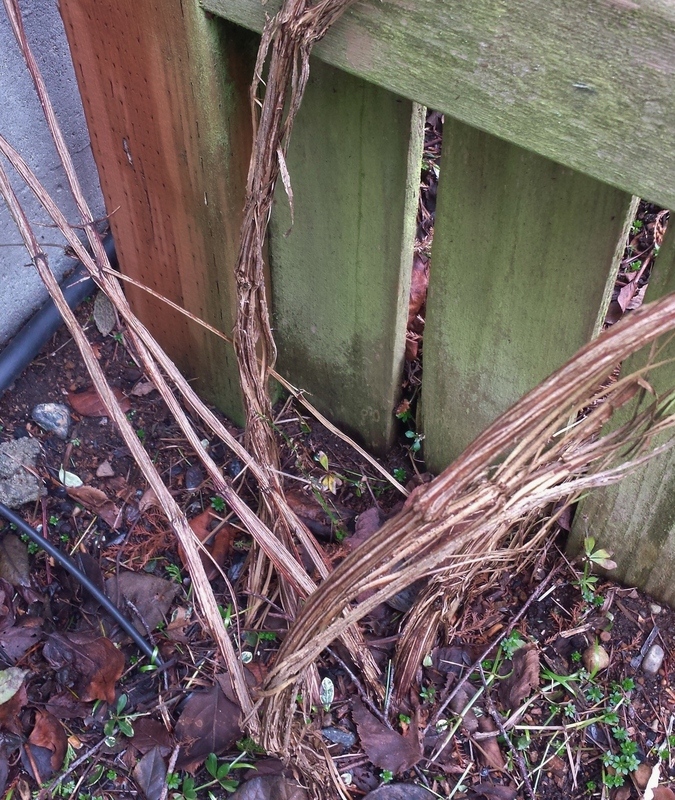 When green growth appeared sometime in February or March, I could easily tell which vines were dead and which living. After a patient three hours of pruning to get all the deadwood out, working from the top to the bottom, the rat’s nest was history–though history will no doubt repeat itself. 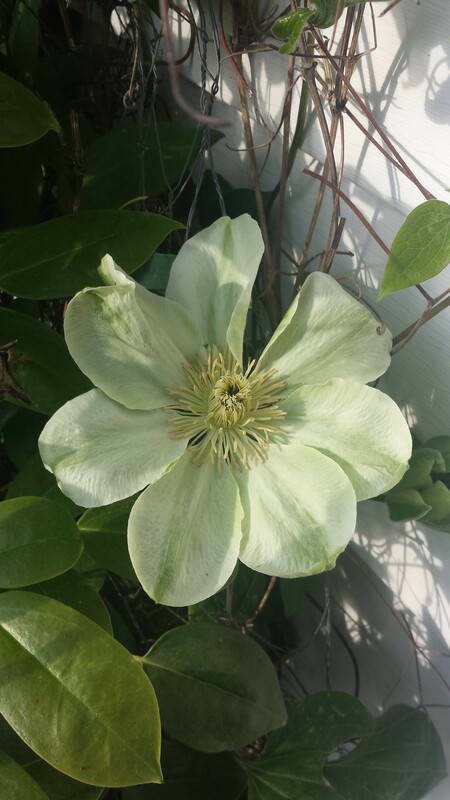 This method of pruning an overgrown clematis–cutting through old vines at the base during the winter, then pruning out the dead stuff when spring begins to push green growth–is one I know I will use again to control my more rowdy clematis. Check out the before and after photos of C. Will Baron’s vines at the base. May is gearing up to be a banner month in the garden this year. Many more of my large-flowered stunners were already beginning the show in late April! The first bud of C. Josephine about to open. C. montana Vera, 40′ up a 90′ Port Orford Cedar! 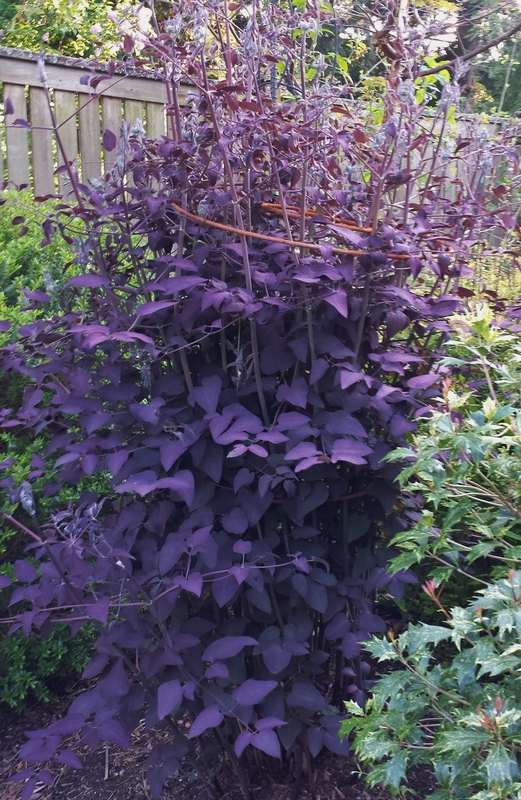 The gorgeous purple leaves of C. recta purpurea, nearly 6′ tall already! The ever-lovely C. Guernsey Cream. C. Fair Rosamond starting to strut her stuff.